If you have seen some of my previous posts, you may know that I am a huge fan of Laird Barron. 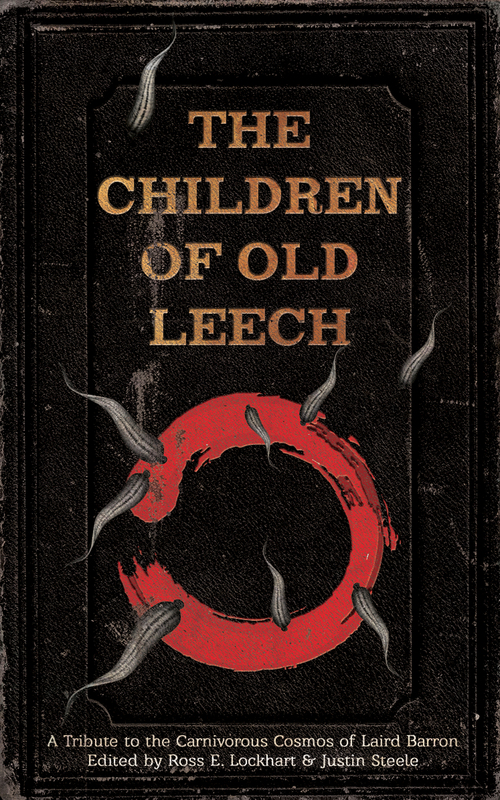 Out this month is The Children of Old Leech: A Tribute to the Carnivorous Cosmos of Laird Barron. The book is a compilation of short stories written in the vein of Barron’s work and features a superb cast of authors. The book starts off with an eerie morsel from Gemma Files called “The Harrow,” in which an amateur archaeologist uncovers a number of mysterious artifacts in the yard of her new house. More greatness follows. “Pale Apostle” by J.T. Glover and Jesse Bullington takes place in a deteriorating import/export house, where a particular package contains more than the proprietors bargained for. And, I especially enjoyed “Walpurgisnacht” by Orrin Grey, which is a celebration of darkness complete with a remote castle, a mysterious film, and a gathering of people who have been invited to the show of the ages. If you are a fan of Barron’s remote and creepy forests, there are several stories that feature this setting. For example, “Learn to Kill” by Michael Cisco incorporates a feeling of ancient alienness that is often found in Barron’s own remote populations, as the narrator faces a merciless corruption of his own body. Richard Gavin’s truly scary entry, “The Old Pageant,” recounts the aftermath of a terrifying story told to a child. And, Stephen Graham Jones‘s “Brushdogs” shows us how easy it can be to simply step from one world to the next. There are also a few stories that are presented in the form of correspondence or diary entries. Molly Tanzer’s story, “Good Lord, Show Me The Way,” is presented in a collection of emails surrounding the mysterious disappearance of a student conducting research for her dissertation. In “Notes for ‘The Barn in the Wild'” by Paul Tremblay, we are allowed to read the diary of a man who set out in search of The Black Guide and found … something. And, in “The Woman in the Wood” by Daniel Mills, we are provided with entries from a centuries old diary where a boy recounts his experiences with a mysterious and dangerous woman. Many of the stories managed to take on different settings and character types that, while different, still complement the overall feeling of Barron’s work. Jeffrey Thomas’s “Snake Wine” takes us to the world of an ex-pat in Vietnam who becomes entangled with a young woman who wields a deadly elixir. An almost psychedelic tone backs T.E. Grau’s “Love Songs from the Hydrogen Jukebox,” whose fantastic guru turns out to be worshipping more than just a magical high. Michael Griffin introduces us to an interesting and ancient ritual performed by an elusive cult in “Firedancing,” and we get a peek into a strange future in Allyson Bird’s “The Golden Stars at Night,” one in which our existence is fragile and not necessarily assured. In Joseph S. Pulver, Sr.’s “The Last Crossroads on a Calendar of Yesterdays,” a couple of guys deliver some very strange books to a reclusive older gentleman, with macabre Nazi ties. John Langan’s “Ymir” provides a new twist on some old characters from more mainstream mythology, while Cody Goodfellow adds a sort of mad scientist twist to his not so mainstream gladiatorial story, “Of a Thousand Cuts.” The collection finishes up on an appropriately creepy note with a pair of drifters, in Scott Nicolay and Jesse James Douthit-Nicolay’s “Tenebrionidae,” who end up taking the ride of their lives. Editors Ross E. Lockhart and Justin Steele have put together a really great collection of short stories and, while the stories here definitely do justice to the flavor of Barron’s cosmos, they are also much different than anything you are likely to have read before. Find out more and score your copy now at Word Horde. I am reading this collection right now, and it is very well done. It’s good to see such recognition for Barron’s work, which is among the best of dark, weird fiction of the last 10-15 years.